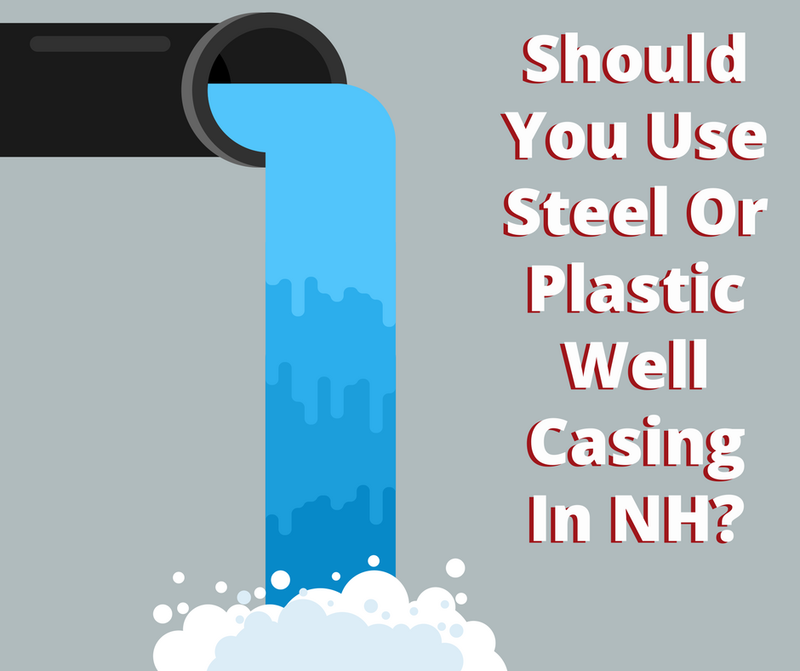 Should You Use A Steel or Plastic Water Well Casing In New Hampshire? We have so many choices in our everyday lives like paper or plastic, diet or regular, and Apple or Samsung. We make these choices based on our personal needs and preferences. When it comes to water wells casings, the choice is best made by a water well professional. While there are two options, plastic or steel, the decision for which to use depends on a number s technical factors that go beyond personal preferences and cost. While plastic may seem like the more economical choice to the homeowner, the choice comes down to elements like practical installation criteria, the type of well and the equipment used, state and local regulations and perhaps cost, depending on if the standards are correct for a plastic casing. Your well water professional will weigh all of these options and make the correct choice. Your well's purpose is to bring water from an aquifer into your home and it needs to be constructed to last through decades of daily use. You water well professional has the knowledge and expertise to determine the technical needs for your situation and construct the proper type of well using the correct materials. The type of casing your water well professional will use depends on several local factors including water chemistry and local geology. The corrosivity factor of the water is important. Highly alkaline or low acidity can be corrosive to metal pipes. Similarly, high levels of dissolved solids or salts may also be corrosive through a process called galvanic current or electrolysis. PVC is extremely resistant to pH corrosion and is not conductive so it does not suffer from galvanic corrosion. Often wells are driven through layers of soil, sand, and gravel before reaching bedrock. The process of seating the casing uses a drive-shoe that is seated before drilling begins. Once bedrock is reached, drilling continues at a smaller diameter without a casing through the bedrock. A driller using proper care can seat a steel or PVC casing into bedrock. Over much of the United States, through a wide range of geological conditions either steel or PVC casing can be used. Here in New Hampshire, we recommend using a steel casing. According to the New Hampshire Department of Environmental Services, plastic water well casings are not recommended. A steel casing pipe is typically seated into a socket in the bedrock by 10 to 20 feet or more. Some professionals recommend cement grouting the casing to the bedrock to ensure a good solid seal. Grouting is an expensive procedure and we do not typically recommend this practice in New Hampshire for private wells. However, for public drinking water wells grouting is required to prevent surface water from channeling down the well casing. We do not recommend using plastic water well casing for private water wells here in New Hampshire. If you are starting a new build, or are replacing an old well on your property, give the experts at Skilling & Sons a call. We understand the unique geology of New Hampshire and Massachusetts and can design, construct and maintain your private water well.